John Wesley throughout his life resorted to the practice of bibliomancy. Bibliomancy is a practice whereby a person seeking spiritual insight selects a random passage from a book, in Wesley’s case, the Bible. His journal is replete with references to this practice, but I bring to our attention the following. John Wesley went to the Georgia colony in 1736 to serve as the settlement priest and as a missionary to the Native Americans. John found comfort in a female acquaintance in Georgia named Sophy Hopkey. But he was concerned that settling down would hurt his ministry. He wanted to evangelize the natives first. After a year, Sophy was getting impatient. Finally, in March, 1737, she made it known that she was going to marry another if Wesley had no objection. One of the things Wesley did when it was time to make a decision was to resort to bibliomancy and drawing lots. During these difficult days of decision, he wrote three slips of paper: 1) marry, 2) think about it after a year, and 3) think about it no more. He drew the latter slip of paper and decided that he was correct in not pursuing marriage. During his time of indecision, Sophy became engaged and subsequently married another suitor. When Wesley later refused Sophy communion on August 7, 1737, stating that they had not properly posted the ‘bands’ for the marriage, he became mired in controversy. It was obvious to most of the colonists that Wesley was acting out of his pique about Sophy marrying another. He claimed he did so for valid reasons, but Sophy's new husband brought him to court for defamation of character. It did not hurt that Sophy’s father was the chief magistrate. Other charges were levied against him (concocted by people seeking ill will against Wesley). After a while, Wesley could take no more and headed back to England, with an unserved arrest warrant for him. I believe President Jimmy Carter finally commuted the warrant, but I don’t recall if it was while he was Governor of Georgia or as President. Bibliomancy was so popular among early Methodists that John Wesley even produced a pack of readymade cards with scriptural excerpts, “Draw Cards”, which Methodists used as a kind of religious parlor game of fortune-telling, as well as a conversation starter. A businessman was in a great deal of trouble. His business was failing, he had put everything he had into the business, and he owed everybody. It was so bad he was even contemplating suicide. As a last resort, he went to his pastor and poured out his story of tears and woe. When he had finished, the pastor said, "Here's what I want you to do: Put a beach chair and your Bible in your car and drive down to the beach. Take the beach chair and the Bible to the water's edge, sit down in the beach chair, and put the Bible in your lap. Open the Bible; the wind will rifle the pages, but finally the open Bible will come to rest on a page. Look down at the page and read the first thing you see. That will be your answer; that will tell you what to do." A year later the businessman went back to the pastor and brought his wife and children with him. The man was in a new custom-tailored suit, his wife in a mink coat, the children shining. The businessman pulled an envelope stuffed with money out of his pocket and gave it to the pastor as a donation in thanks for his advice. The pastor recognized the parishioner and was curious. "You did as I suggested?" he asked. The Foundry was the home of several of John Wesley’s ministries in London. The former cannon works (Old King’s Foundry) was purchased by Wesley as a chapel in 1740 and was referred to simply as “The Foundry.” Over time, the Foundry became home to a school, a bookstore, a clinic, a home for the elderly who were destitute, and on Tuesdays, beginning in 1744, a place for members of the Methodist Societies to find micro-loans. Originally, the loan limit was 20 shillings or one pound. In today’s dollars that is something less than $100. It was capitalized with 50 pounds. During the life of the loan program, many tradesmen who had sold tools during times of unemployment were able to buy new tools through the micro-loan program. For example, during a very severe winter a stone mason might not find work. In order to survive, he would be forced to sell his hammers and chisels. With the return of good weather, he would not be employable without his tools. The most famous of the micro-loans went to James Lackington. Lackington became the most successful book dealer in London, and it all began in 1774, when the 26-year-old Methodist applied for a loan to start a used book business. The loan’s upper limit by then had been raised to five pounds; he received the full five pounds. Within a few years, Lackington was a very wealthy man, and his book store, “Temple of the Muses," was London’s largest. Unfortunately, James Lackington did not stay within the Methodist fold. His departure reminds me of the old tale of the single mother with three small sons ranging in age from six to ten. The Sunday School at the Methodist church noted their absences over a period of several weeks and went to their home to inquire. The mother, obviously embarrassed, told the Sunday School Superintendent that she didn’t have enough money to provide new Sunday clothes for the boys and was reluctant to send them in tatters. The Superintendent shared this news with the pastor, and together they found enough money to buy the boys each a new suit, which were delivered to the home. For the next three weeks, the pastor and Sunday School Superintendent were on lookout for the boys, but alas they did not come to church or Sunday School. The pastor went round to call on the mother. He asked had they not received the clothes, and she replied that indeed they had, but the boys looked so good in them they were now attending the Episcopal church. In the months ahead I intend to focus this blog on John Wesley’s letters. Wesley maintained an unbelievable correspondence during his life. Many of those letters have been collected and offer insights into Wesley’s opinions and advice. A young preacher once asked John Wesley, "How can I get crowds to attend my church services?" Wesley replied, "Get on fire, and people will come out to see you burn." During John Wesley’s life England experienced some of the most severe winters on record. In fact, the period is often spoken of as the Little Ice Age. It began in the Fifteenth Century and continued into the Early Nineteenth Century. During this era, the River Thames often froze over. One story (legend) from the early 1600s purports that William Shakespeare’s acting company, along with a small band of helpers and roughnecks, carted the various parts of their timber-framed theater away from its original location in Shoreditch and stealthily made their way across the ice of the frozen Thames to its new location in Southwark, where it would later become famous as the Globe Theater. In doing so they avoided the taxman on London Bridge. With the River Thames frozen, not only could things be moved across the river, but people could enjoy skating, food booths, drinking booths, games of chance, rides, and performance artists. A few years ago I had the opportunity to see a newspaper from 1788. The paper was owned by a good friend, Rev. Frederick Maser. Dr. Maser was not only an exceptional Methodist preacher; he was also a recognized Methodist historian. Related to his interest in Methodist history, he had become a collector of things related to John Wesley: books, letters, and ephemera. The newspaper was in this last category. He pointed out the front page article about the Frost Fair being held on the Thames. It spoke of the fair as a fairyland all lit up with lanterns at night. The article extolled the great joy that people of all ages had on the ice. After showing me this account, however, Fred directed me to another, shorter article on one of the inner pages of the paper. The headline to that article was, “Mr. Wesley’s Societies Collect for the Poor”. What was most interesting was that the poor in question were the very people who were out of work due to the prolonged freeze of the river: longshoremen, sailors, fish mongers, and so on. The paper caught for me the spirit of Methodism, which is to be aware of the joys in life and to participate fully, but to not let those joys blind us to the needs of others. Have you ever considered John Wesley as an architect--not the architect of our denomination, but actually designing a church building. That church is City Road Chapel in London. It is also referred to as Wesley’s Chapel and was built to replace John Wesley's earlier London chapel, The Foundry.The site was purchased from the Corporation of London in 1776. After considerable funds had been raised, the foundation stone for the new chapel was laid on April 21, 1777. On that day Wesley preached on what God had accomplished through him and the Methodists (Numbers 23:23). Although Wesley designed the building, he was wise enough to use the architect George Dance the Younger, surveyor to the City of London, to provide the building plans. Built by Samuel Tooth, a member of the Foundry Chapel and one of Wesley’s lay preachers, City Road Chapel was opened on All Saints’ Sunday, 1778. Even though Wesley called his chapel "neat, but not fine," its Georgian lines and other features are quite attractive. It faces Bunhill Fields across the street, where his mother Susanna is buried along with several notable Non-Conformists. Wesley's tomb is behind the chapel. 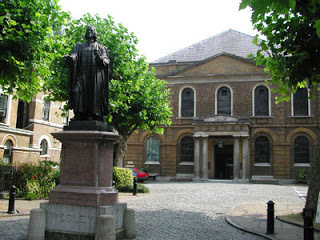 Wesley used City Road Chapel as his London base. The chapel was the first Methodist church in London built for the celebration of communion and preaching. It is not the first Methodist church, however; that honor belongs to the New Room in Bristol. In 1891, to mark the centenary of Wesley's death, the chapel was refurbished. The original oak masts that supported the gallery, a gift to the chapel from King George III, were replaced with marble pillars from around the world. As it was the Civil War era, the chapel received two pillars from America: North and South. One year after the completion of the chapel, Wesley built a house on the property. He spent the last 11 winters of his life here and died in his bedroom on March 2, 1791. An art print from the era shows Wesley on his deathbed surrounded by several friends and associates. Having visited the house myself, I can only wonder how all fifteen people fit into such a small space (11ft. x 14ft.). Artistic license? Former British Prime Minister Margaret Thatcher got married at Wesley's Chapel in 1951. A devout Methodist, she attended services here from time to time, but the security arrangements eventually made it very difficult to do so. She donated the current communion rail.